Manage your company’s expense management programme with American Express @ Work, a powerful online tool that maximises visibility and control over your Card programme. The expandable suite of @ Work online tools allow you to execute administrative tasks, streamline report generation and draw insights from spend data in a single place online. Increase your liquidity, whilst ensuring that your vendors are paid on time. Pay suppliers through American Express and get up to 51 credit-free days1 without any added credit interest to pay your statement, allowing funds to earn interest or be used elsewhere. Card Member can enjoy greater flexibility in spending with no pre-set limit2, your purchasing power can increase over time as you use your card. No pre-set spending limit does not mean unlimited spending and charges are approved based on your payment history, credit records, spending pattern with us and your current financial resources. You can spend as spend as much as you can afford to pay back, which gives your business greater financial flexibility to cater for different business needs. The Corporate Card programme allows companies to strengthen cash flow by coordinating billing, payment and reimbursement cycles. Enhance cash flow control with a choice of 10 cycle cut billing dates. With the Membership Rewards programme Card Members can earn 1 Membership Rewards point for every eligible Hong Kong dollar spent on the Corporate Card3. These points have no expiry date and are redeemable for air travel and hotel stays, as well as shopping, home and recreation items. 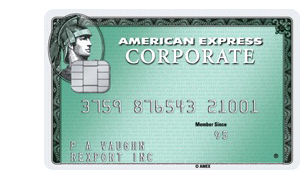 The American Express Selects Programme4 provides access to savings and offers. Card Members can save up to 20% on dining in Hong Kong, Sydney, New York, London and other destination cities. Plus, enjoy a wide range of discounts and special offers for travel, entertainment and shopping when travelling abroad. With enrollment, Corporate Cash5 allows employees access to cash for travel emergencies and incidentals at over 600,000 ATMs worldwide. For legal and medical emergencies while travelling, Card Members can call the free Global Assist6 service, which will connect them with an English or Chinese-speaking lawyer or doctor. The service is available 24 hours a day virtually anywhere in the world, whenever Card Members travel more than 200km from home, for up to 90 days. Business Travel Accident Insurance7 of up to HK$1,500,000 provides accidental death or dismemberment coverage while travelling on business trips booked using the Card. The American Express Corporate Card guarantees protection against fraudulent transactions on your Card, provided responsible care has been taken and as long as we are notified immediately8 after discovery of any fraudulent transactions, in compliance with Card Terms and Conditions. American Express SafeKey further enhances online transaction security with added security measure to safeguard your online purchases. Our Card Programme offers an advanced, robust global spend management solution designed to solve the challenges of international payments. Our experienced team will work with you to determine where can you generate savings, streamline processes and improve control, wherever you do business. With the option to convert and bill all charges in a single currency, you can gain more control over the cost of foreign exchange. Potential processing costs and foreign exchange charges associated with international B2B and T&E payments can be reduced. Standard tools and simplified processes are in place across over 150 markets around the world to help you achieve efficiency. In one single agreement, global terms and convenient monthly payment, our Card programme allows you to streamline complex, labor-intensive processes, eg. high volume of smaller/recurring payments. American Express has invested in the oversight and control you need to successfully navigate the complex, global regulatory environment. Striving to comply fully with local market and country regulations, you can be confident in your spend management program, wherever you do business. 1. 51 credit-free days: Actual credit-free period will vary based on the date of charge and the billing cycle cut-off date. 2. Subject to American Express’s risk management policies. 3. Membership Rewards: To enrol in the Membership Rewards programme, Card Members can call (+852) 2277 2150. The annual membership fee for Membership Rewards Frequent Flyer option is HK$400, or 12,000 Membership Rewards points; and for Membership Rewards Non Frequent Flyer option, the annual fee is HK$120 or 3,600 Membership Rewards. To view the full Terms and Conditions of the programme, the complete range of offers available and which partners are involved in Membership Rewards, please click here. An annual Membership Rewards fee applies; enrolment is not automatic and subject to Company approval. Subject to the Terms and Conditions of the Membership Rewards programme available here. There may be tax implications associated with your participation in the Membership Rewards programme. You are advised to check with your accountant or tax advisor for further information. 4. American Express Selects: Terms and Conditions apply. 5. Corporate Cash: Requires Company participation and Card Member enrolment. Subject to terms and conditions. 6. Global Assist Hotline: You must arrange all medical and visitor transportation. As the Global Assist Hotline is an assistance service, we cannot reimburse you for expenses you incur on your own. Please refer to the Global Assist Summary of Coverage for additional details and restrictions. 7. Business Travel Insurance: The plan is underwritten by Chubb Insurance Hong Kong Limited, American Express International, Inc. does not act as an agent or fiduciary for you, and American Express International, Inc. may act on behalf of the insurance provider, as permitted by law. Exclusions and limitations apply. Please refer to your Travel Protector plan for details. 8. SafeKey®: Secure online shopping with American Express SafeKey. Click here to learn more. American Express reserves the right to require proof of resources and/or security. If there are any differences between the English language text and the Chinese language text, the English language text, for all intents and purposes, shall prevail.